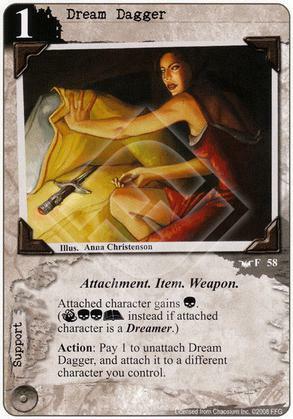 Action: Pay 1 to unattach Dream Dagger, and attach it to a different character you control. If you run a lot of Dreamers, basically a no brainer. There are 18 dreamers spread among 6 fractions (7 counting neutral), its not that easy to run dreamers. And i really hope future big packs will refresh dreamer/dreamlands support mechanics and day/night mechanics of this cycle, as currently there are next to none day cards, and dreamlands supports idea of "only most on table plays" doesn't do much. If timed with dreamlands reprint it would be realy fun. We are overdue for a few more Day cards, but I don't expect to see them in the Yog box! Even though I only have packs 3-6 of the Dreamlands cycle, I've been able to build an effective Dreamer deck or two. And with new cads 1 domains tend to be needed, also this cost's a card. I wouldnt call it no brainer, but might help a deck with dreamers that needs more icons. Have to agree with the above, worth it with dreamers, not so much without. I like the action as it means the opponent has to treat every card of yours as if it has more combat icons as long as you have a domain open. This is extremely niche playable without using the Dreamer synergy, especially in a combat-lite deck. Being able to bounce it around different characters makes it a ton more appealing, and if you can turn on the extra icons you can really get the gravy train rolling. It seems like this card would be a blast in a Dreamer deck that also includes Snowmobiles. Wouldn't even need to go the Captain route, so it would free the deck up from having to use Day cards.